A cool collection of songs written for the steel drum in a reggae style. 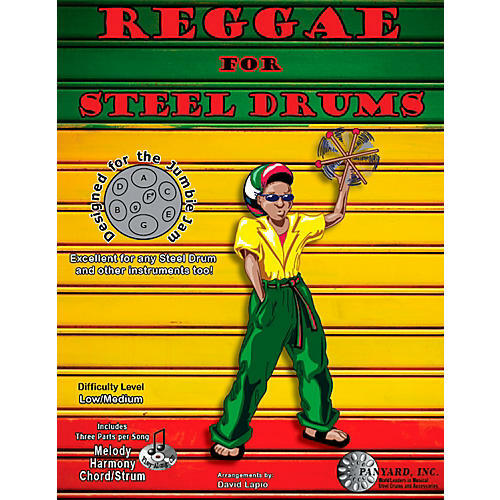 The Jumbie Jam Reggae for Steel Drum Songbook and Play-Along-CD provides charts and tunes that educate and allow you to jam with the band or hone your skills with the practice tracks. The book can be used to play other instruments too. Each song includes three parts; melody, harmony and chord strums; enabling your family and friends to jam as a band. Written for beginners to intermediate players, you dont have to know how to read music to use Jumbie Jam song books; the notes are marked by the note letter, which match the notes marked on the Jumbie Jam. Standard musical notation is also included, helping you to learn how to read music. It contains eight different reggae songs for the Steel Drum; Three Little Birds, Dont Worry Be Happy, Keep On Moving, Brown Eyed Girl, Drift Away, Is This Love, Red Red Wine, and Day-Oh.